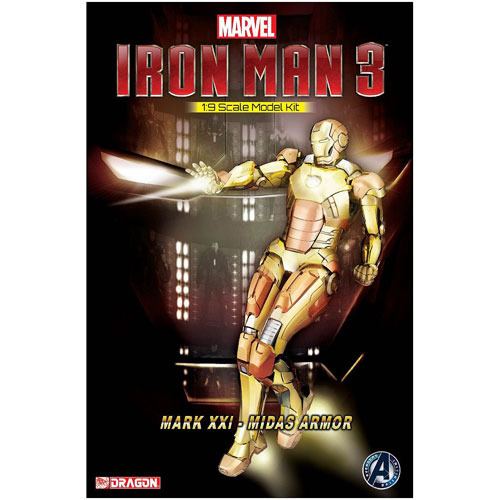 The Iron Man 3 Mark 21 Midas Armor Electroplating Version 1:9 Scale Model Kit! Can be assembled in about an hour with few parts involved! Made with an eye to perfect accuracy and authenticity, the Iron Man 3 Mark 21 Midas Armor Electroplating Version 1:9 Scale Model Kit faithfully reproduces the Mark 21 from the movie Iron Man 3 in 1:9 scale. To ensure that it is as easy to assemble as possible, the model figure is separated into very few hollow plastic parts. In fact, within about an hour, you can assemble your Iron Man 3 Mark 21 Midas Armor Electroplating Version 1:9 Scale Model Kit. If you're a Marvel Comics fan, reader, or simply know one, you can't go wrong adding the Mark 21 kit to your collection! The Iron Man 3 Mark 21 Midas Armor Electroplating Version 1:9 Scale Model Kit requires glue and paint, not included. Ages 14 and up.